@AnnieGal Banks. Staunch allies of the far left. @00dani @alpacajess @AnnieGal think it was when some nazi got banned from paypal, so i think they mean the money kind of banks. Why, is putting people in camps bad or something? Is that something to avoid? Something which might reflect poorly on one's character? Is it cruel and immoral or something? Just asking questions. @offtheball My post was a joke mocking the far right fever dream of leftists putting Trump supporters in death camps (gulags), basically saying "lol I wish." I did not mean to imply the post was representative of your views. The question was posed to the absent poster of the original thing, not you. 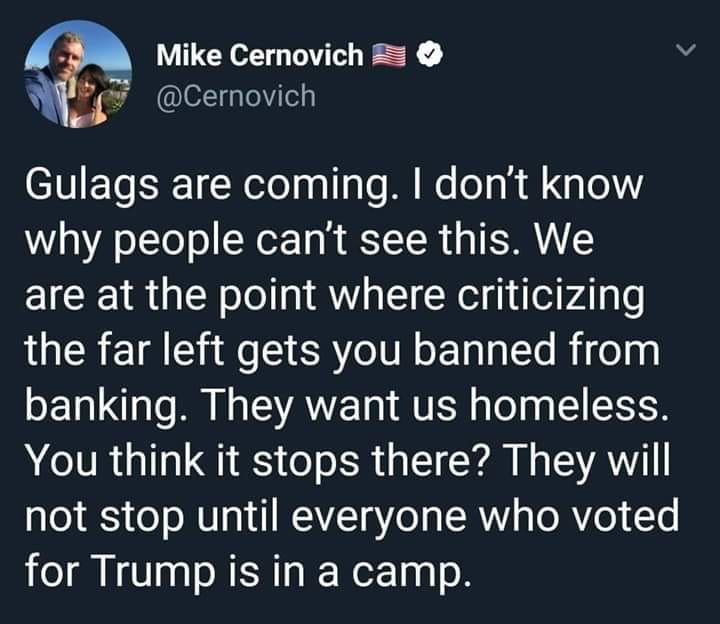 @offtheball Well, Cernovich probably won&apos;t be reading this, but I&apos;m willing to guess that his views are that camps are bad unless they are for immigrant children then they are very very good. Because you know camps is a thing that has actually been done before and now, generally by the kind of people they are claiming we wish to subject to that fate.